A new garden shop opened yesterday! 😀 I love the exterior, with the warm colors and tulip-flowerboxes, it looks like a pretty cottage. ^_^ There are often birds around it too. I like the shop-owner, Leif 🙂 His stock is not the most extensive right now — just two flower bags, 1 sapling, and 1 tool (either a watering can or an axe, I think). I’ll try to buy everything each day in the hope that it expands eventually. WiFi crashed again, unfortunately, but thanks for letting me see your town, Cheryl! At Re-Tail I found Cyrus awake for the first time! He offered his assistance in refurbishing furniture. I’m not really sure how it works, but it sounds like a neat feature to add more customization and uniqueness when decorating rooms. I paid off Violet’s and Estel’s home loans yet again yesterday. I don’t really have any business doing this since I hardly have any furniture, but I think the exterior of the houses gets prettier in later expansions, and I’m eager to see it! Estel got a new upstairs room today. Just keeping a few balloon items up there for now. 😛 I also bought a new mailbox for her today that matches perfectly with this wall. I’d like her house to look like an elegant white mansion one day. 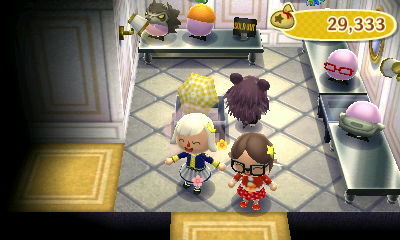 After expanding Violet’s house twice, I can finally see the flowery decorations on the wall! 😀 I paid off her loan again today, so she’ll have an upstairs room as well tomorrow. Fern got a new door. I saw it at Nook’s Homes and thought, “that’s perfect for the rustic feel I want for Fern’s house!” But I ended up not really liking how it looks on her house. I’m not good at visualizing how different house parts will look put together, I guess. I didn’t get any hybrids yesterday, but today I got three: a pink cosmo, pink lily (yay, I’ve been hoping for one! ), and an orange pansy. Built a new bridge today! It’s another cobblestone one. I want a different bridge that I haven’t unlocked yet, but the unlocking process seems to be pretty slow, so I figure I should go ahead and build one. Geez, I was hoping my neighbors would at least pitch in a little, but I had to pay for the whole thing! Posted on June 19, 2013 by Amy •	This entry was posted in AC:NL, AC:NL WiFi, Citalune and tagged Animal Crossing. Bookmark the permalink. Oh my god, I feel like i’m totally missing out. 😛 I haven’t been playing AC:NL for 3 days.. All I could do all day was either look for hybrids and new clothes/accessories etc. and talking to villagers… 😛 Sad no one came to your new bench’s ceremony. 😛 Maybe it was too late at your time. xD Also, love Estel’s house! I really feel like this will be a really, really successful town and i can see your improvement in every post you make! 😀 I haven’t even build a bridge yet, I was planning to go up to 1,000,000 bells first. I’m still at 400,000..
Yeah, it wasn’t a convenient hour for anyone to come, I guess. 😛 It was strange to see Isabelle going through the ceremony with only me there to witness it! Well, I’m pretty sure your town will be a really developed town soon! I’ve been neglecting my AC:NL lately… so you guys might even be more advanced than me now… 😛 probably. Nah, I haven’t done too much as far as town development lately either. Just one bridge and two benches. 😛 I’m putting more thought into planning now that I have my gridded map, though! The Summer Solstice today is pretty cool, but it means I can’t build anything I guess. Aww, I’m sorry I missed it, I would’ve loved to come! I was happy to find him, he has amazing prizes! Thanks for clearing that up; I was regretful that I didn’t try to get something with my other characters, but I guess I didn’t miss out on anything after all. Thanks, I’m glad you like them! 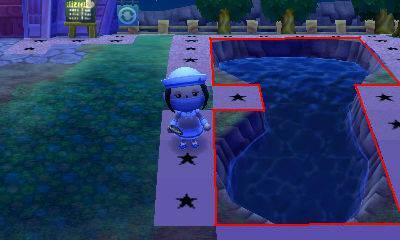 I feel like I’ve been somewhat lucky with the house parts showing up at Nook’s Homes. 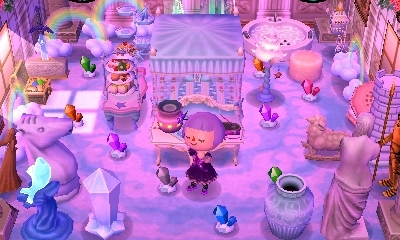 I’m so glad you liked my town! ^_^ I didn’t really plan anything tho… Planning gives me a headache so I just go with the flow. Anyways, how do u even make a map like that?? The gridded one? I just made the map using MS Paint, and used holes and patterns to measure things in my town. I feel like rain is more forgivable when it’s a thunderstorm. xD Unfortunately, I’m still waiting on a thunderstorm — all I’ve had for the past week is clouds and rain! I think it’s cool that you’re going for a split town layout (half city, half country). My own plans for Miagen is to make it super rustic and old-fashioned-looking; kind of like the vision you have planned for Fern’s house? (I’d recommend using one of the stone roofs… it’s an instant rustic/farm house transformation!) And as for the door she’s got now… it would look better if it weren’t so tall! I agree, and nighttime thunderstorms have a great summer feel to them. Though I miss the sunny weather I had when I first started my town… at least there always seems to be nice weather on the island if I want to see clear skies and stars again. The garden shop is so cute x3 I used to think Leif was a bit creepy (I think it was his face), but I like him too by now 🙂 Same with Isabelle; I wouldn’t want any other assistant. I don’t know why, I’ve always liked seeing neighbours’ houses clumped together. 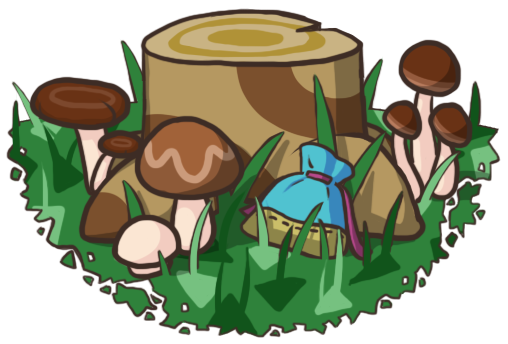 It gave a cozier towny feel and in the case of NL frees up space elsewhere for largescale landscaping 😛 Of course it depends on where they are clumped up… and how their houses look. Whoooa, really? No-one came to your yellow bench ceremony? 😛 Was it at a bad time or did everyone think keeping dry was more important? Wow, Estel and Violet’s houses are looking good, especially with the flowers you’ve collected! Lol yeah, I wish putting in new projects was more of a community effort, but I don’t think villagers put in more than a few hundred Bells. Isabelle is especially sweet, probably one of my favorite NPCs now! I feel like she has a lot of personal touches to her dialogue, different from the business-like dialogue you go through with most of them. Jesus. You progress a LOT in just 2 days. I am so jealous. Oh no, I’m really sorry to hear that! 😦 I would be upset as well if it were me, I love hybrids and take pride in growing them. I hope that you’re able to grow them back! By the way, this is Tammy! Hey Tammy! 🙂 L+R (the top buttons) takes an in-game screenshot, which is saved to your SD card; then you can put your SD card into the computer and import them. thank you so so so much for letting me know! I was getting so frustrated trying to figure it out. But that sounds simple enough now that you explain it..Thanks! ❤ But how did you get the river and whatnot that patterns cant go on so accurately on your gridded map? Actually, I figured out how you did it I think! 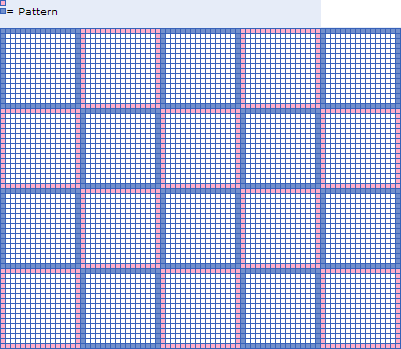 and then count the size of inside the red line block by block..right? i think i explained that right enough XD but it works for me! You should do a tutorial on how to grid map your New Leaf town for others who might be interested in making landscaping easier. I think alot of people would find it helpful! Sorry for not responding earlier — wanted to respond last night but my computer was acting up. But yeah, it seems like you’ve figured it out well! I did the same thing, but with digging holes. 🙂 And as for the rivers going through the middle of acres, I’d just try to complete as much as possible on one side of the river, and then I’d go to the other side of the river and complete that side. 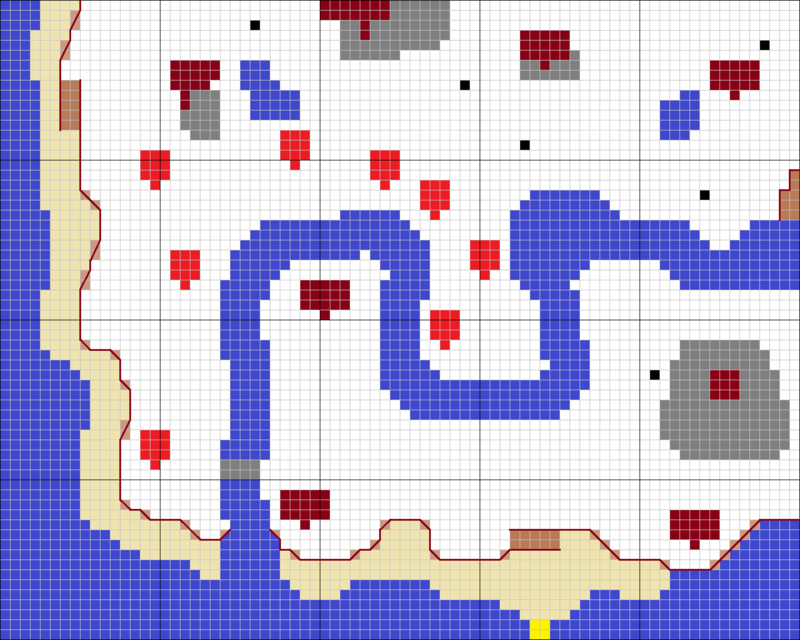 When the river is straight, it’s usually 4 spaces wide, so that might help when plotting the river. I never thought of that; I’m hoping that a program for New Leaf similar to Sarouk’s gridded town generator for Wild World comes out eventually. 😛 It’d make things a lot easier! 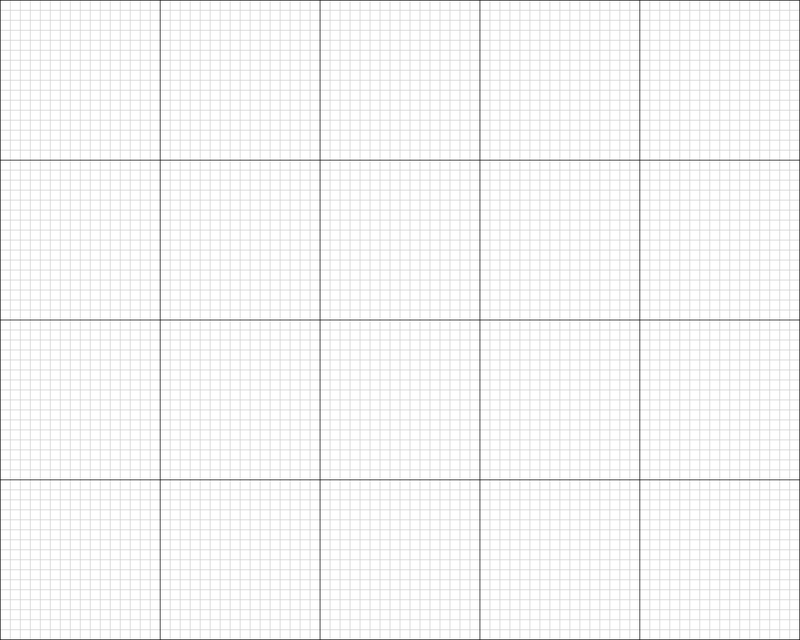 I made my grid by coloring in squares in a grid on MS Paint, while walking around my town measuring the distances between buildings, rivers, and other objects with patterns and holes. It was a lot of work, but it’s a very helpful map to have and I use it a lot!